Thousands of new products will be on display at SHOT Show 2018, the huge gun industry trade show held each January in Las Vegas. Some of the most highly-anticipated products (such as new Lapua ammo with Berger bullets) have not yet been revealed. However, the SHOT Show Product Planner offers a “sneak peak” at 338 new-for-2018 products. More will come in the weeks ahead. For the time being, however, here are ten interesting new products. Since these are all completely new items, we haven’t been able to test them yet. All product descriptions are provided by the manufacturers. We also spotlighted six other new products in November. CLICK HERE for November Product Preview. Starline Brass has recently added the 6.5/6mm family of cartridges to their growing line of rifle cases. Starline is now producing 6.5 Creedmoor (available in both Large Primer pocket and Small Primer pocket versions), 6mm Creedmoor, and 6.5 Grendel. Here is the Ultra HD version of the 2d Gen long range camera system from TargetVision. The LR-2 Ultra HD works the same as the LR-2 model, but the Ultra-HD has enhanced 5 megapixel resolution (2492 X 1944) instead of the standard 1.3 megapixel resolution (1280 X 960). Also the range is reduced from 1 mile to 1200 yards. The LR-2 Ultra HD is a portable, battery-powered, wireless target camera system that can be viewed from a phone or tablet. This target camera has a range of 1200 yards with run time of 12+ hours. The Caracal Enhanced F pistol is a striker-fired, polymer-framed 9mm handgun. It is offered with either standard 3-dot dovetail sights or the acclaimed Quick Sight System, which places both front and rear sights on a single focal plane, enabling the shooter to acquire a much faster sight picture. The Enhanced F pistol has 18+1 capacity and is available in 12 configurations. The PhoneSkope Adaptor lets you record everything you see through your riflescope. Unlike other smartphone adaptors, the PhoneSkope lets the shooter look through the scope normally — through the eyepiece. Your eye and the phone camera view the same image. Record a target string or hunt. The PhoneSkope fits nearly all riflescopes and can adapt to most bolt-action rifles. PhoneSkope also offers adaptors for spotting scopes. The innovative BipodeXt TAC III increases the stability of any rifle / bipod configuration. Moving the bipod far forward extends the rig’s “wheelbase”, creating a more stable platform. The BipodeXT TAC III mounts to the rifle’s fore-end. Expect less bipod hop, recoil that is more “straight back”, and faster follow-up shots. The BipodeXt’s telescoping 3-tube design is made from carbon fiber and aluminum. For 2018, Berry’s has upgraded the VersaCradle™ Gun Vise. Star knobs allow you to switch from one configuration to another without tools. With the VersaCradle 360° Ball & Case you can adapt to a shooting rest, multi-use vise, or a stock checkering cradle in seconds. Available C-clamps allow easy mounting to table or bench up to 2” thick. Other accessories include floor stand and table-top base. The new Sicario is a two-piece, integral handgun suppressor that can be quickly detached without tools — use the factory magazine to disassemble the suppressor. The monocore is constructed from anodized 2024T351 aluminum with stainless insert. Alignment is easy with “fast attach 28” thread mount system. This suppressor is offered for all Ruger MK I,II,III,IV pistols as well as Browning Buckmarks, S&W Victory, and Colt Cadet. 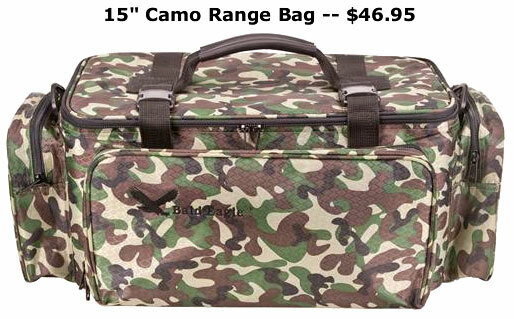 The GPS M/L Range Bag features an internal foam cradle for 5 medium-sized handguns. The lid is reinforced to provide a stable location for eye and ear protection as well as a space for tools. The front compartment holds 6 magazines and comes with two ammo cups. The bag is made from HD 600 denier material and all stress points are boxed stitched and bar tacked. Convenient, top-loading design loads your rifle from top (like a toaster). The unique, soft-sided hard case won’t scratch your vehicle. Extra-thick foam interior keeps gun protected and secure zipped pocket holds extra shells, cleaning kit, or accessories. This TSA-compliant rifle case features external D-Rings for tie downs or locks, plus a shoulder strap. Size: 49″ L x 4″ D x 11″ H.
The first new, automatic reloading press in over 15 years, the Mark 7 Revolution is a modern, computer-controlled, automatic machine capable of loading up to 3,500 rounds/hour. Microprocessor monitored and controlled, the new Mark 7 is fully automated. It features, smooth, gear-based machine movement and 10 stations that can use off-the-shelf reloading dies. Share the post "New Product Showcase for SHOT Show 2018"
Lars Dalseide, editor of the NRAblog, found a cool new product for pistol shooters and 3-Gun competitors. The new NRA Handgunner Backpack provides a convenient transport solution for your pistols, magazines, and assorted range gear. This product offers all the carrying capacity of a large range bag, in a design that, when worn on your back, leaves your hands free to haul long-gun cases, target frames, spotting scopes, or other bulky hardware. Measuring 17″ wide, 22″ high and 9″ deep, the pack has plenty of room for your gear. The cleverly-designed Handgunner Backpack carries up to four pistols. Undo the zipper, slide out the compartment, place your pistols in one of the four foam gun cradles. Store your magazines in a zip-up side pocket with six (6) individual mag sleeves. There are also specially designed compartments for ammo boxes, muffs, protective eyewear, target stapler, and more. You’ll find handy embroidered patches showing the right spot for each gear item. Lars tells us this pack is comfortable and sturdy. The shoulder staps and the rear back panel feature moisture-wicking padding. To keep the rain out, the pack comes with a waterproof cover. And the pack won’t collapse when you set it on a bench — it is designed to stand up on its own. We’re impressed with the design and features of this pack. A lot of smart thinking went into its design. As you might expect though, because the Handgunner Backpack has so many features, it’s not cheap. This specialized backpack sells for $119.95 at the the NRA Online Store. We don’t think that’s too much, considering what this pack can do. This could be a sweet Xmas gift for the pistolero or 3-Gun shooter in the family. If you are running a shooting match, the Handgunner Backpack would make a great prize — way more useful than a walnut plaque. Share the post "Handgunner Backpack Holds Four Pistols and All Your Gear"
The MidwayUSA Competition Range Bag is on sale, through April 20, 2010, for $39.99. That’s $20.00 off the regular $59.99 price. With 14 total pockets or pouches, this 22″L x 15″W x 10″H bag has plenty of carrying capacity. This is a BIG bag, nearly twice as wide as some other range bags. We saw many of these Midway Range Bags in use by top shooters at the recent 2010 F-Class Nationals. Don’t be fooled by the discount price — this is a quality piece of kit that is very versatile, thanks to the removable components inside the large main bag. These include a removable stage bag/ammunition carrier, two removable pistol rugs and a removable fired brass or ammunition carrying bag. NOTE: The bag is currently back-ordered, but it should be back in stock by 4/18/2010. The $39.99 special price applies to black-colored bags. Also, a handsome new olive drab version will be offered for $59.99, with availability in mid-summer, 2010. Share the post "Sturdy, Jumbo-Sized Midway Range Bag on Sale — $39.99"